Cooking for the busy mom! I try to do the best with the time that I have. Enjoy! This recipe is actually my family's secret recipe. Ha ha ha ... just kidding! 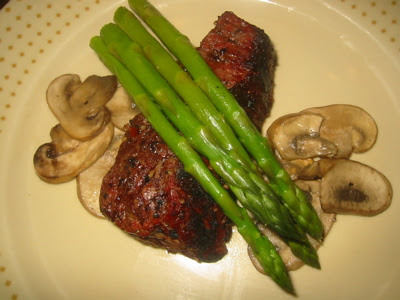 We had been searching for a simple and delicious steak marinade for a long time. Finally, my husband found one online. Since then, we have always used this recipe. Usually we serve the steak with its friend: spicy sweet soy-lime sauce, asparagus and mushroom stir-fry, and warm white rice. We love it! Combine the Montreal Steak, olive oil, and soy sauce in a large bowl. Mix until the soy sauce is thoroughly mixed into the olive oil. Put the steaks into the bowl and make sure they are well coated with the marinade. Grill the steaks on a medium high heat for 7 minutes on each side. Make sure you let the excess marinade drip off before you put them on the grill or you will have flare-ups. Cooking time will vary, depending on your grill. Let them cool for 5 minutes so that the juice from the steak won't be running out. Cut them into thin slices - make sure you cut against the grain so that the meat is most tender. 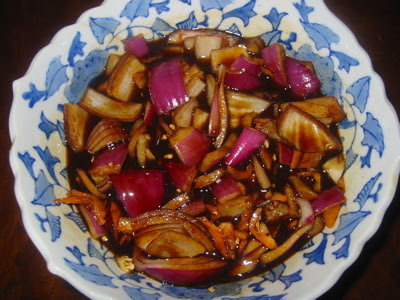 Combine together red onions, hot peppers, sweet soy sauce, and lime juice into a bowl. Mix them well.